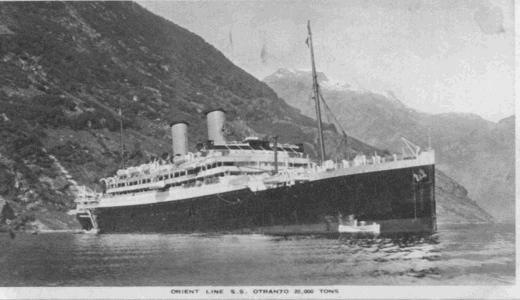 The SS OTRANTO (Orient Steam Navigation Company ) sailing from Port Said to Southampton with 223 Displaced Poles from Lebanon, arriving on the 19th of January 1948. AGE OCCUPATION PROPOSED ADDRESS IN THE UK. 4 BEDNARCZYK A 45 H.D. Fossebridge Stowell Park Camp Cheltenham. 7 BIENIAWSKI W. 57 Bailiff 297, RAF, Station. Castle Combe, Chippenham Wilts. 16 CZICHOWSKA W. 50 H.D. H.Q. 46 Group, RAF Bushey Hall Watford. 17 DĄBROWSKI F. 66 Teacher Moreton-Hall, Whalley. nr. Blackburn, Lancs. 19 DĄBROWSKA M 55 Dentist Castle Combe, RAF Station Wilts. 24 FALINSKA A. 49 H.D. Rushmoor Maelow Rd. Stokenchurch, Bucks. 28 GAJEWSKA I. 20 H.D. Hodgemoor Camp nr. Amersham Bucks. 29 GOGOL W. 71 Farmer 3, Kensington Park Road, London W.11. 35 HARBAK D. 63 H.D. 501 Basic Unit, PRC4 Witley Camp Godalming Surrey. 36 HARBAK J. 29 H.D. 37 HEILMAN J. 22 H.D. Barkford Camp Kardford Billinghurst Sussex. 39 HERT D. 44 H.D. Leconfield near Beverly Yorks. 43 HROKALO-HORAWSKA J. 39 H.D. Shuttleworths Hostel 23 Well St. London E3. 46 HRYNIEWICZ B. 50 Book Keeper 10 Bridgeman Terrace, Wigham Lancs. 47 HRYNIEWICZ B. 52 H.D. 48 JAEGER E. 59 Teacher. R.A.F. Station Halton Bucks. 54 JASIEWICZ S. 55 H.D. 55 JASIONOWICZ R. 33 H. D. Ossington Camp Newark Notts. 59 JEDLINSKA G, 52 H. D. c/o 5 St. Vincent Av. Doncaster R.A.F. 69 KOŁTONOWSKI W. 60 Painter R.A.F. Castle Combs Chippinggham, Wilts. 73 KOTARBA K. 14 Student No. 1 Wing R.A.F Hilton Bucks. 74 KOTARBA M 42 H.D. 75 KOTLARZ H. 42 Houses Keeper c/o son R.A.F. Melton Mowbray Leicestershire. 78 KOŁODZIEJ W. 58 Farmer c/o R.A.F. Moddle Walop, Stokebridge Hants. 79 KOŁODZIEJ K. 50 H.D. 84 KOWAL J. 16 Student 128 Studley Road, Wast Hartlepool Durham. 87 KRYSZYŃSKA F. 48 Nurse Chippenham Centre Polish Resettlement Corps Newmarket. 93 KUKIETKA M. 54 Houses Keeper Cark Camp Flookborough,. Carnforth Lancs. 95 KULIK A. 17 Student Lilford Hall Camp, Oundle Northants. 96 KWIECEŃ F. 48 Taylor Oulton Park Camp Tarporley Cheshire. 100 LENKO W. 54 Housewife Wills Hall Stoke Bishop, Bristol 9. 102 LEWANDOWSKA S. 39 H.D. Staythorp, Newark Notts. 107 MALINOWSKA M. 45 Seamstress R.A.F. Station Leconfield Nr Beverly Yorks. 108 MARKWART M. 59 Ex-Soldier R.A.F. Chesington, Nr. Surbiton. 109 MARKWART P.. 56 H.D. 112 MAZGAKCZYK B 27 H.D. 124 NIZIOL J. 47 H.D. Polish Resettlement Corps U.K Address Unknown. 134 PACYGA J. 43 H. D.
145 POGODA S. 23 H. D. Langton Housew Hostel Blandford Dorset. 158 SŁAWINSKI W. 62 Forester Castle Combe R.A.F. Chippingham Wilts. 159 SŁAWINSKA M. 53 H. D.
161 SMERCZAK W. 58 H.D. 165 SOBIERAJSKI F. 50 Artisan R.A.F. Station Rodles Manor Howthorn Wilts. 170 SOBOLAK F. 72 Farmer Revanhall Canp witham Essex. 171 SOBOLAK M. 63 H. D.
172 SOBOLAK A. 36 H. D.
175 SOLCZYŃSKA H. 26 Accountant 9. Challoner Court London W14. 179 SUCHOCKA W. 50 H. D. Woodlands Park Camp Great Missenden Bucks. 182 SUCZSZEWICZ S. 36 H. D. Hursley Camp near Winchester Hunts. 185 SYKORA M. 48 H. D. Babdon Camp near Tetbury Gloucestershire. 192 SZWED L. 41 H. D. B.W.A.E.C.Hostel Whaddon Bletchley Bucks. 194 SZYMAŃSKA S. 51 H. D. Polish Resettlement Corps. 195 SZYMAŃSKA J. 23 H. D.
201 TRYJANOWSKA M 38 H. D.
210 WIERZBOWSKA E. 27 H. D. c/o Władyslaw. Moma Camp nr. Gwalchmai , Anglessey. 211 WOCH J. 64 Locksmith R.A.F. Castle Combe Chippingham Wilts. 212 WOCH M 57 H. D.
214 ZAGAJEWSKA W. 50 H. D. Greenbanks Hostel Horsforth nr. Leeds Yorks. 221 ZALAWZKA Z. 49 Dressmaker RAF Station Castle Combe Chippenham Wilts.